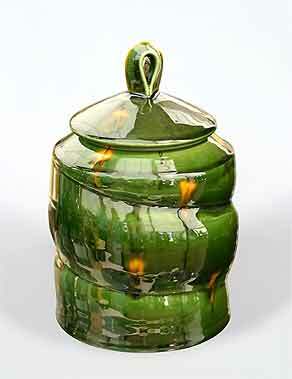 Kevin de Choisy jar with lid - 8½" (215 mm) high. Kevin de Choisy was born in 1954. He trained at Harrow School of art under Colin Pearson and Walter Keeler. Kevin spent much time in the United States between 1978 and 1991 working in various pottery related positions and filling in time between ceramic jobs as a truck driver. He became a little disillusioned with pottery, due to the mundane and tiring work he had to do, but was inspired by Warren McKenzie and his fellow Minnesota potters. On his return to England he became, at Walter Keeler's suggestion, a ceramic technician at the University of the West of England. While there he met Jiro Takaishi, who was visiting from Japan, and was able to spend time experimenting, exchanging ideas and developing new techniques. Kevin is passionately interested in early eighteenth century ceramics - in particular the work of Wedgwood before the onset of industrial-scale manufacturing. His current work is based on early creamware; he uses a white earthenware body with very rich bright glazes. He produces a striking design effect by painting latex patches over a base glaze and then spraying a different coloured glaze over the pot before picking off the latex. The very shiny finish is achieved by the application of a very thin third glaze.